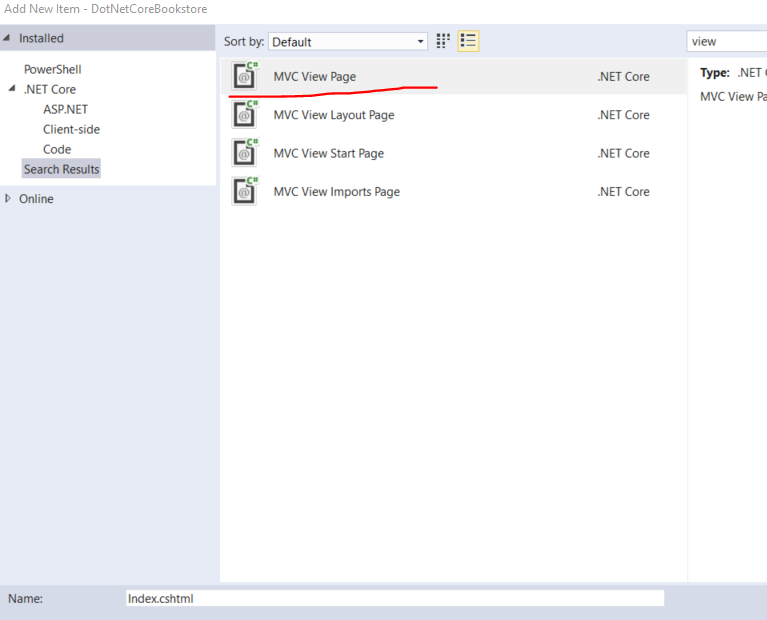 In the previous post we started looking into MVC in .NET Core. We added a new library through NuGet and wired up the MVC middleware in Startup.cs. Routing is about mapping parts of the requested URL to a controller and an action. The controller is a normal C# class which most often derives from the Controller base class. The action is a C# function that returns some type of response to the HTTP request. The action can have 0, 1 or more parameters that must match the query parameters of the URL otherwise the routing engine won’t find it. We also wrote our first controller called the HomeController and the first action called Index which corresponds to the /home/index URL. We also discussed the basics of routing and added a very basic convention based route to Startup.cs. In this post we’ll look into the various return types of a controller action. We’ll also build our first HTML view using Razor. We’ll be working with the DotNetCoreBookstore demo application as before. Note how the class is called BookViewModel and not just Book. 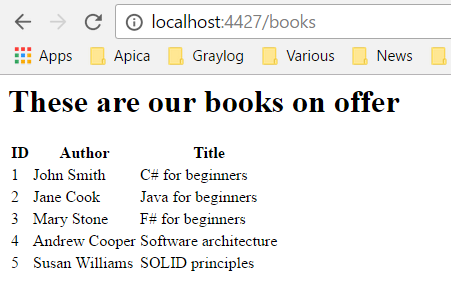 We can on the one hand have a domain object, also called an entity, called Book in another C# class library in the solution. On the other hand it’s also possible that we don’t want to expose the full Book object to the View depending on who’s asking for it. So a single domain object Book can have multiple view models that only contain the information that the requester is supposed to see and use. E.g. the controller may ask a service class to get a list of books. The service can decide which properties of the Book should be visible to the caller. E.g. if the caller has elevated rights then they may see more than normal users. If this is new to you then just keep in mind that a single domain object which often includes its own logic can have one or more distilled view models that are only meant for viewing and/or data binding purposes. The IActionResult interface is an interface for a wide variety of return types of actions. It’s very rare that an MVC action only returns a plain string like our current home controller. Instead, there are specialised action result objects that help us build proper HTTP responses. The available result objects often map to a standard HTTP status code like 200 OK, 201 Created, 400 Bad Request etc. No, you won’t get any books from here!!! If you skip the last parameter, i.e. the file download name, then the downloaded file will get the name of the streamed file with no file extension like “books” which may be confusing for the client. There are many more response types like that. We’ll look at two more interesting and important ones. Let’s start with ObjectResult. This object has no dedicated function like the ones we’ve looked at so far. The object result in turn comes in different shapes: object result, bad request object result, not found object result and OK object result. All of them require an object that can be serialised. It’s time to build our first HTML view and list our books in a table. A controller action can return a ViewResult that’s linked to a view file. If you used ASP.NET MVC before then all of this is familiar to you. The standard HTML generator engine is Razor like before. Razor view files have the extension cshtml which obviously indicates a mix of C# and HTML. In Razor views we can have standard HTML alongside with embedded C# code to build dynamic views. A view can have a model which is injected by MVC. Most views will have some object dependency but this is not mandatory. These conventions are in place so that MVC can find the correct view without explicit coupling. We declare the model of the view using the @model declaration. In our case it’s a sequence of book view models. Then we have some easy HTML including a table. The Model property refers to the model declared by the @model directive. C# code in Razor is separated from HTML by the at sign ‘@’. In the for-each loop we loop through the list of book view models and print their available properties. In this case MVC will be looking for a view file called someViewName.cshtml in the Views/Books/ or Shared/Books folder. However, since we followed the default naming conventions this is not necessary. Great, we’ve just closed the full MVC cycle in ASP.NET Core. We get a URL which is matched against a controller/action method combination. The controller builds a view model which is passed into a matching view. The view is then sent back to the user and rendered in the browser. We’re making progress! We’ll continue in the next part soon.